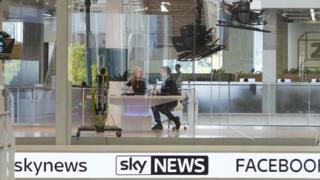 Rupert Murdoch's 21st Century Fox has increased its offer for UK broadcaster Sky to £24.5bn. This tops a previous offer from rival bidder Comcast and is part of an escalating battle between media giants, including Disney. Fox is expecting to obtain regulatory approval in the UK for the deal this week. The firm has been waiting for the go-ahead from the government before putting the deal to shareholders. Fox has been trying to get approval from UK regulators since 2016 to buy the 61% of Sky it does not own already. Fox has been trying to address those concerns by offering concessions, including selling Sky News to Disney once the deal is complete. In June, the then Culture Secretary, Matt Hancock, said the Fox deal could go ahead if it sold Sky News, with certain conditions. What are the issues in Fox's Sky deal? Comcast, the US media giant that owns NBC and Universal Pictures, made a £22bn offer for Sky in February, trumping a previous offer from Fox that valued Sky at £18.5bn. The government is expected to give its decision on Fox's Sky bid on Friday. If the Department of Culture, Media and Sport gives regulatory go-ahead for the bid, as is expected, then Fox has 28 days to notify shareholders that they need to vote on the deal. The end of the week also happens to be the deadline for Comcast to post an offer to Sky shareholders, who then have 60 days to consider that offer under UK takeover rules. The new bid for Sky is a whopping 80% more than the market thought Sky was worth before the bidding war started. A source close to the deal said: "It's absolutely unbelievable - they are way overpaying." And I'm told it's not done yet. "I think Comcast want it more - and will be back." The big question may be for Disney, which, if the price goes any higher, may start to think that the company they want to buy - Fox - is overpaying for Sky. As one source at Sky told me: "If you can figure out what the strategy is here, then let me know." Here goes: the approval of the merger between AT&T and HBO's owner Time Warner in the US started an all-out global media arms between old giants and new pretenders such as Netflix. In that arms race for content and distribution, price is secondary to scale. And Sky - with its 20 million subscribers in Germany, Italy, UK, Spain and Ireland - hands the victor European distribution at scale on a single (increasingly expensive) plate. The skirmish for control of Sky is being fought in the shadow of an even bigger battle - a struggle for control of prized entertainment assets owned by Fox, including its stake in Sky. Disney and Comcast are locked in a battle for those businesses which include movie studios, cable channels, National Geographic and a 30% stake in video website Hulu, as well as Indian network Star. In June, Disney raised its offer for those assets to $71.3bn (£54bn) in cash and shares. Under the deal, Fox would keep Fox Sports, Fox News and Fox Television Stations and make them into a new company called "New Fox". Established media companies like Disney are looking for deals that would help them meet the challenge of fast-growing rivals including Netflix and Amazon. George Salmon, an equity analyst at Hargreaves Lansdown, said: "There's enough sub-plots in the race to acquire Sky to commission a prime-time drama." Another Fox offer for Sky was no surprise in itself, he said, but the offer was slightly lower than anticipated, which brought another twist. "There's every chance it might entice another counter from Comcast. That might explain why the shares still trade above the latest offer price," he added. "Whoever ends up in control will have acquired an attractive asset, but the price tag can't be ignored." Shares in Sky closed on Wednesday at £14.94. A year ago they were trading at just under £10.